This article actually has nothing to do with Cromat. This ephemeral journey into the depths of my unconscious produced a spark of inspiration to create my first 5-color EDH deck. I found two main challenges in building a successful rainbow deck: forming a cohesive strategy, and building a proper, consistent mana base. This article was originally going to talk about my strategy for Cromat, but I didn’t think it would be as original or insightful as talking about building a mana base for a 5-color deck. So why write about 5-color mana bases in EDH? All you have to do is empty your binder of all its dual lands, shock lands and fetch lands, right? That should fix up your mana just right! Well…yes and no. My first point of contention is that not everyone has a set of duals, shocks and fetches available. For those who do, more power to you, but for some players it’s not very feasible. The other thing is that even if you do use all those fancy lands, without tailoring your mana base to your spells you’re running the risk of playing a deck that’s less consistent than you’d like. Jake’s guest article on Reaper King touched on this aspect of tailoring your mana base, and you can see from his lands that he has a good idea of what mana he needs by a certain point in the game, and what lands are best for getting that mana. In short, he’s got a plan. This article is about formulating your own plan to get the mana you need, when you want it. It’s like a double Time Walk! What makes dual lands so good? Duals (ie. the Beta and Ravnica variety), on their lonesome, are not sufficient to power a 5-color EDH deck. But those little basic land types make them so very good. With the full 20, every fetch land you use essentially reads, “Get whatever damn color you want.” And with land type-centric ramp spells like Farseek and Skyshroud Claim, it’s easy to see why duals can make fixing quite easy. *An exception I would make is for Ravnica bounce lands, which work best with a large contingent of basic lands. The theory with fetching duals is that every land you get has the colors you want. Hence, in a functional sense, every land is a rainbow land. You may not have the colors you need going into the long game, but for each particular turn up to that point, you’re getting the mana you need. Fear not; we are also going to turn each of our lands into rainbow lands. But it’s going to take a bit of strategy. As I mentioned earlier, this article is especially geared towards players who want to build a 5-color deck, but don’t have all the tools they might want. I mentioned in my Phelddagrif article that the downside of using cheaper mana fixing lands is that most of them enter the battlefield tapped, or enforce some other measure of tempo loss. Aside from running bad cards, this drawback is unavoidable but not insurmountable. Like the Cylons, it’s just a matter of having a plan. To start, how many lands should you run? Mana screw happens to even mono and two-color decks, so we should be doing as much as we can to make sure we don’t fall behind with our more intensive spell color distribution. My 5-color list runs about 40 lands, not including mana acceleration and fixing. The high count lets me consistently hit my land drops, and I offset land draws with tutoring and cantrips. Vivid lands, Alara tri-lands and Planeshift Lairs form the core of my own land suite. The strength of these lands is that all of them can produce three colors or more. You can supplement these lands with 5-color producers like Reflecting Pool, Gemstone Mine and City of Brass. There are also more deck-specific land choices, like Pillar of the Paruns and Primal Beyond. With a sizable portion of your lands producing multiple colors, you’re less likely to lose out on a color you need. When these lands work together, they will frequently provide the colors you need, and often. Always keep an eye on the number of lands that cannot help you the turn they enter play. If you run too many, you’ll be severely hamstringing yourself in the early game. Yes, EDH can be slow in the beginning, but that’s no excuse to play with a slow curve. I play with about 13-14 ETB tapped lands out of the 40, which I’ve found to be a reasonable number. But you have to consider the potential draws you’ll get. An opening hand with a Vivid land and a Lair is just awkward. No matter how many rainbow lands you’re running, basics are absolutely necessary to ensure a reasonably smooth draw. Forty lands, with 10-15 basics, will likely give you a hand of two non-basic lands and one basic land, which is perfectly fine. Basics are great plays on the second and third turns, giving you the untapped mana to play ramp spells or other acceleration. Casting fatties will be within your grasp. 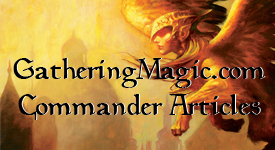 Five-color fixers: These permanents offer a greater degree of freedom in casting your spells. Fist of Suns, Prismatic Omen and Joiner Adept provide redundancy in blanket mana fixing. I cannot count the number of times Prismatic Omen has eased up my game. Green ramp: I can’t stress enough how useful Green mana acceleration is. Not only do they add lands to your table, but they thin out your deck, increasing your chances of drawing business spells. They also fill in the missing colors on your board. My ramp spells of choice are Harrow, Explosive Vegetation, Kodama’s Reach and Reap and Sow. The dude variants – Sakura-Tribe Elder, Yavimaya Elder and Solemn Simulacrum (artifact-ness aside) – also offer great value for your mana. In 5-color, I think it’s always a good idea to skew your colors at least a bit toward green just so you can run the ramp spells. In my opinion, they are the go-to cards for getting your mana up and running. They’re also excellent for Sensei’s Divining Top/Brainstorm type effects. Artifacts: It’s really easy to get hooked on mana artifacts because there are so many available. Darksteel Ingot, Coalition Relic and Spectral Searchlight are all awesome, but I’d hesitate to run any others. Getting set back by a sweeper is really painful, and not something you’d want to risk. In my EDH experience, lands are always the safest mana producers. Mana dorks: These guys fall under the same umbrella as mana artifacts – great for acceleration, but very frail. Like artifacts, it’s good to run two or three (Bloom Tender, Birds of Paradise, Noble Hierarch), but I personally don’t like relying on them. Unlike artifacts, you can’t use them the turn they enter play unless they have haste, which makes them a tiny bit of a liability. What your precombat main phase will look like. When you use multiple ways to fix and accelerate your mana, your deck becomes more consistent. Not only that, but you’re always advancing toward the goal of having all your lands produce any color you want. Continually layering these tactics will make your mana base stable, and allow you more design space and flexibility in what spells you want to play in your deck. Building a 5-color EDH deck might seem a bit daunting, but I find it fun and challenging to solve the problem that is the mana base. The neat thing is that no one’s mana base will look the same, because it will always reflect the spells you’re playing. In every EDH game I play with Cromat, I’m always forced to think several steps ahead about what mana I need to play a particular combination of spells in a turn. I hope what I’ve written wasn’t glaringly obvious to everyone, and I also hope it gives people a few new ideas or just food for thought. Have fun! This entry was posted on Wednesday, June 9th, 2010 at 1:44 pm	and posted in Derfington's Corner, EDH, Uncategorized. You can follow any responses to this entry through the RSS 2.0 feed. I loved the Article. I myself am running a very successful 5 color EDH and have already followed many of these ‘rules’. Great article, and good luck with “Chrome Dome”! Thanks for the tips on creating a budget 5-color manabase. I have a 5-color deck (Scion) that uses all the Ravnica bounce lands, Shards tri-lands, Vivids and some other lands that give 5-colors. This however, gives me some awkward starting hands and overall slow starting turns. So I might revise my deck now with the information you provided :). One cool tech I have in my deck though is the Karoos + cards that allow me to play additional land each turn (e.g. Azusa), which can really speed things up. The tips are good but you forgot to mention Land Tax. It works really well in combination with basic land fetchers like Journeyer’s Kite, Armillary Sphere and all the green ramp cards you mentioned (Harrow, Kodama’s Reach, etc. ), because it means most of your manabase will be basic lands. Awesome article! I’m surprised you didn’t mention the Filter Lands from Shadowmoor and Eventide — with Vivids, Shards Tri-Lands, and the full 10 filters (plus other random lands and artifacts, of course), you can build a more “budget” five-color manabase that offers nearly the same versatility as the dual/fetch engine. The Odyssey filters are even cheaper to buy, though not quite as good. Very nice article. I run five color with the basic Vivid and Alara. Though I am hoping that the commander decks have Wedge Tri Color lands like the Alara lands. I also run Vesuva, Rupture Spire and the M10/11 duals. Which is 17 Tapped lands at max. But usually I only need 2 or 3. Then the ramp gets me ahead of what I should be so more tapped lands make me happy.